Garmin has been marketing their Approach X40 GPS smart watch as a golfer’s companion. This is evident in the marketing materials released for this particular product. The watch itself can, however, still function as an efficient tracker for other outdoor activities. This is thanks to the multitude of impressive tech packed in the stylish wearable device. Fitness and outdoor enthusiast can still get a lot out of the product, but golfers will likely be the ones to get the most out of it. The Garmin Approach X40 GPS Golf Band is slim and sleek. Its design is on the minimalist-side, but this does not hinder it from providing a myriad of information to its user. Its 1-inch display may not be as big as its competitors, but the small high-resolution screen is more than enough to relay important data. The watch itself can handle a lot of abuse, given its rugged design and water resistance. Users can also choose from many different colors. This includes colors such as black, white, limelight, and midnight blue. Garmin has incorporated a lot of useful tools on the Approach X40, most of which are utilizing the watch’s highly sensitive GPS receiver. The built-in GPS can quickly show distances and measurements for various uses. Being a “Golf Band,” most of the watch’s functionality leans primarily towards the sport itself. The X40 can perform a myriad of functions related to the sport. This includes tracking shots and showing distances to green, bunkers, and water hazards. Using many built-in sensors, the watch can even analyzing swings. Golfers will also appreciate the fact that Garmin has loaded the watch with more than 40,000 golf courses from around the world. 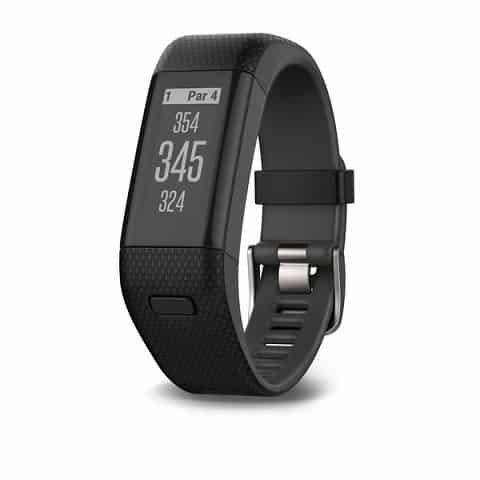 The watch can track the nearest golf course and load up the precise distances and details about the course. After the game, the Garmin Approach X40 GPS Golf Band gives users a detailed post-game analysis. Users who like to brag about their recent games can upload the information online. Aside from the golfing functionalities, the Garmin Approach X40 also sports other useful features. This includes a 24/7 heart rate monitor to track burnt calories. The sensor can also track a user’s sleep if worn in bed. The GPS smart watch can also track steps and distance covered through its GPS sensor. This can be very useful for activities such as walking, cycling, trekking, and running. With the GPS turned on, the Approach X40 can last up to 10 hours of use. For users who only use its other monitoring activities, the watch can last up to five days. While there are better-dedicated golf watches available in the market, the Garmin Approach X40 GPS Golf Band is still a product to consider. This is mainly because of its impressive amount of tech that is useful for other things aside from golfing. The watch does have a massive list of functions specifically for golfers. However, its multi-activity tracking features are nothing to scoff at. The watch’s stylish design and its quality build also separate it from the pack.